Kim built a rain garden (read bog) in their backyard. 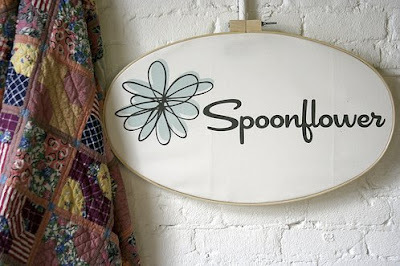 While researching the names of bog plants for the garden, they came across Spoonflower and liked it enough to buy the domain. 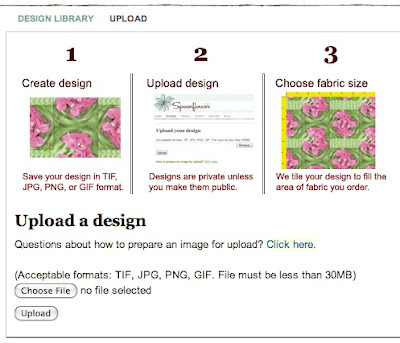 Now, I had heard mixed reviews of the results from Spoonflower, so I approched it carefully with eyes open, but personally I have found it to be very good at all stages – no complaints from me, and I found it very easy to set-up and use. First you need to create an account: the usual stuff with a username and password. From there you upload your design as a TIFF, JPEG, PNG or GIF – so basically anything you can create or convert to Photoshop is usable. 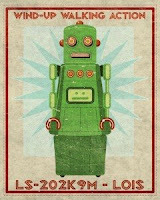 There is an online design tool, but I am very competent in Photoshop, so I will stick to what I know. 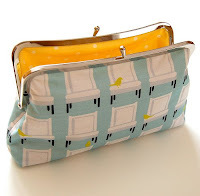 Then you simply choose the design you want to print and select from a range of sizes of fabric in a choice of two fabric weights; a Quilting weight, which is 4oz per yard; or a heavier Upholstery weight, which is 10oz per yard. A quick 8 inch square swatch is US$5, and is well worth getting to check that your design’s colour is coming out as you would like. 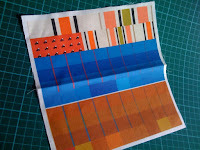 I recently did a swatch (see below) where I crammed on a load of tests I wanted to do, to varying success, and got them printed together to save costs. Once you have received that, or are feeling confident, you can order between one and three yards at a time, which is about enough for the average project. 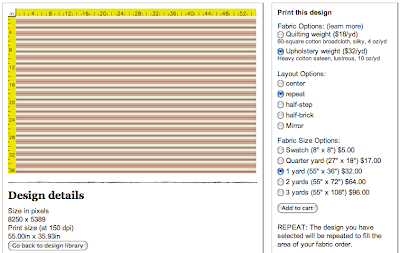 There is no specific minimum order, but a quarter yard is the shortest you can order. In the pursuit of perfection, it is easy to spend inordinate amounts of time searching for a match for a screen-used material and ultimately not find it. A case in point is the blue pinstripe Tennant suit material. As part of the costume display at the recent Earl’s Court exhibition, there was a board showing the blue suit with a swatch of the material used (see right). It revealed something quite interesting. 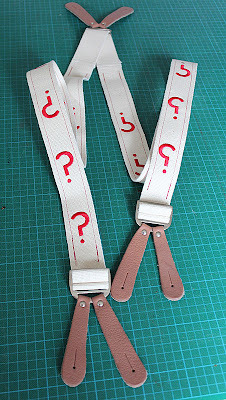 There were actually two swatches: one was as seen in the series; the other was much lighter blue with bright red pinstripes and was labeled ‘ORigiNaL FABRiC’. This was because it had been over-dyed with a darker blue to arrive at the screen used colour (see left). This seriously complicate matters, as it means it does not exist as screen-seen, but would have to be found as it was woven and then over-dyed to get a match, and that would be hit and miss until it was done right. In a circumstance like this it may just be easier to directly recreate the fabric as it looks rather than match it as manufactured, and Spoonflower is just made for that job! 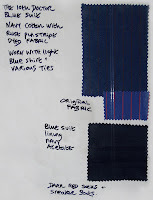 I am working on some blue pinstripe fabric, as seen in my test swatch, but if you are eagle-eyed you might notice the design for Peter Davison’s trousers and hat band there too. I have never seen the hat band ribbon, even when I went looking for it in 1982 while it was current; and the trouser fabric was discontinued during the Davison era, resulting in him wearing a different design of trouser for his final season. All this makes it near impossible to accurately match these on a budget, without Spoonflower that is! I quite enjoyed making my Six Trousers recently, and would like to continue getting some tailoring experience so plan to make some Five trousers as well. Ironically I stumbled across some fabric which is almost (but just not quite) identical to the Five fabric, made by of all makers, Malabar (see below). However, finding a truly perfect match for the striped fabric would be near impossible. It was a fabric from Malabar’s Shamois range, you may recall, I used for my Mk II and Mk III Tennant coats. 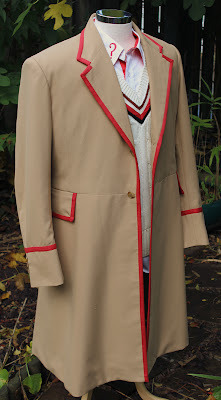 The design I am using for my Five fabric comes from Mark Ferris, a friend from the Doctor Who Forums who lives in Australia. He has been working on the design for a while (see below). With his permission I have taken and refining it further with a view to getting it printed. Mark had produced the design in Photoshop at low resolution, so I redrew it in Illustrator for clarity, making it pin-sharp, before exporting an RGB jpeg that Spoonflower could print from (see below). I choose the upholstery weight, as I felt the quilting was a little thin for making my trousers. The fabric comes 55 inches wide, so I can get the height of a trouser leg across the fabric. I have ordered 2 yards, as I don’t think a single yard would cover it. Orders take about two weeks to be sent out, so it is not an over-night service. The fabric arrived this week, and I must say it is a very nice user-experience when it arrives. My fabric arrived wrapped in tissue paper, with a Spoonflower sticker to keep it snug (see left). It’s like Christmas! I carefully opened the tissue paper and my fabric was inside, complete with a nice little compliment slip, fabric printed naturally! (see right). What I think I am going to do is keep this printed logo, and sew it into the back of the trousers when they are done, as a sort of designer label! I unfolded the fabric and I must say I am very pleased with the result (see below). It is a very good match to the design I supplied; there is no sign of any banding (that I had been warned can happen); and the upholstery weight I have gone for is just right, being heavier than the first tests I had done, but not at all stiff the way you might think. The plan now is to get some more experience making trousers before attempting the ones for the final suit, so making some Five trousers fits the bill perfectly. I will start cutting them just as soon as I can. I love it! Do you have the name of the fabric on spoonflower, I am making my 7 month old the pants and this fabric would be perfect!